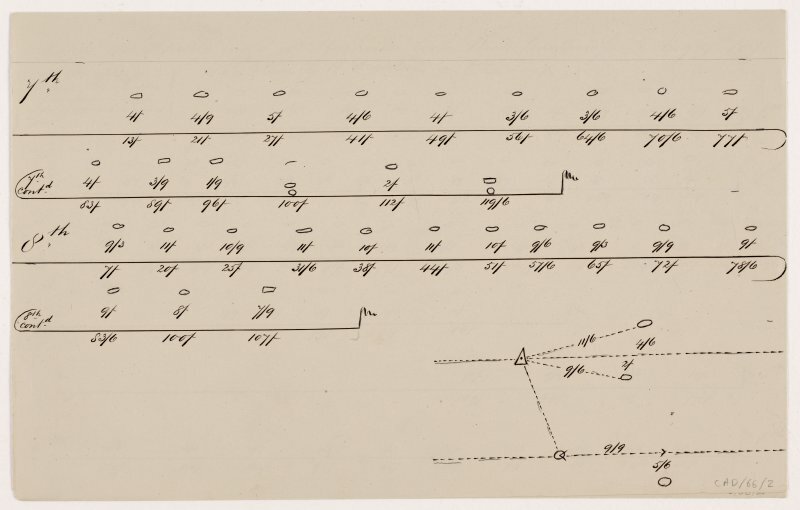 Plan of Battle Moss stone rows. Location also formerly entered as ND 313 440. Eight stone rows, six of which are almost complete for a distance of about 138ft. The row shown on the OS map as 384ft long has been almost completely eradicated by cultivation although the remaining fragments are scattered over a distance of 304ft. The rows are aligned almost due north and south and are generally parallel, 5 to 7ft 8ins apart. The stones, slabs about 3ins thick, face across the rows and are up to 1ft high. J Anderson 1886; RCAHMS 1911. Mainly as described by the Commission. Only one stone remains of the most easterly row and the longest row now measures c. 40.0m. Visited by OS (R L), 26 April 1967. ND 313 440 Excavation was undertaken in August 2003 at Battle Moss multiple stone rows and a nearby newly discovered cairn in the Yarrows Loch area. 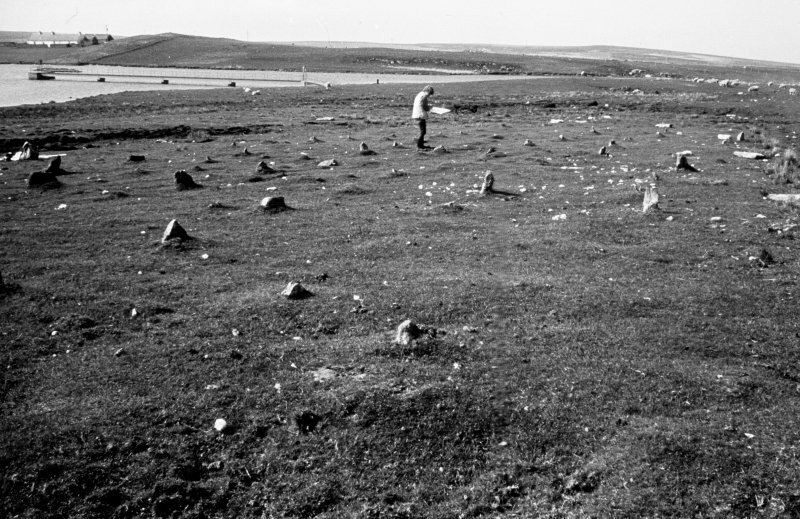 The stone rows were surveyed as long ago as 1871, and several times subsequently, but along with all similar sites in Caithness and Sutherland, had not yet been subject to excavation. The discovery of a putative cairn immediately to the N of the rows fitted a pattern of association noted at other multiple stone rows in the county. The stone rows consist of eight irregular but parallel rows of 18-21 stones. After the removal of the topsoil, apparent gaps in the rows were found to be where stones had fallen over in prehistory and had been sealed by peat growth. Excavation focused on a trench that uncovered 17 stones towards the centre of the monument, seven of which were fully excavated. In each case the same sequence of stone erection seems to have occurred: a narrow shallow slot was dug into the very compact boulder clay subsoil; the slot was lined with clay and/or turf, on which the flat stone was placed and held upright by packing stones jammed in on either side; and a layer, consisting of redeposited natural and charcoal flecking, seems to have been spread around the stones at or soon after erection to form a low platform. Smaller trenches were placed to establish the full extent of the monument. No evidence was found to suggest the monument continued beyond its current known extent, although several putative stones at the S end of the monument were found to be in situ. 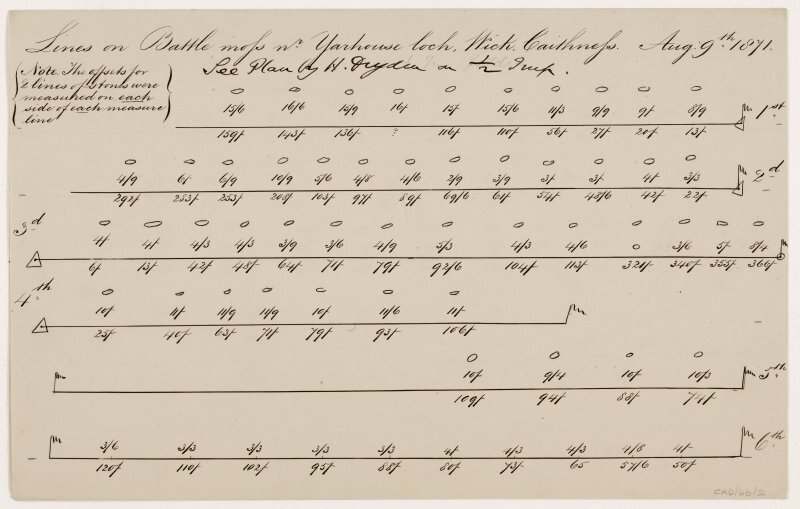 Attempts to find evidence for one of the eight rows shown as continuing for some distance to the N, in a survey by Henry Dryden of 1871, were fruitless. No diagnostic finds or datable material were recovered in a secure context. However, initial impressions of the monument are that it may have been built in segments or phases over an unknown period of time. There is strong evidence to suggest that at some point in the development of the monument an additional row was added. The excavation of a probable cairn identified by geophysical survey, 100m to the N of the stone rows, was also undertaken. This proved to be a probable ring cairn, comprising a low circular cairn around 12m in diameter with a centrally positioned open area. The central area was oval, approximately 2m in diameter, and defined by large rounded boulders apparently laid on top of the pre-cairn ground surface. Two large slabs were identified, laid on the pre-cairn surface slightly to the SE of the centre of the setting, upon which at least two deposits of coarse pottery and cremated bone had been placed. The central setting was found to have been filled with a deposit of yellow silty soil, within which several discrete patches of distinctly coloured soil were identified. A third deposit of cremated bone was identified within a discrete concentration of silty clay within the soil fill of the central setting, indicating that there had been several phases of deposition within the central cairn area. A small disc of highly oxidised metal was also recovered from this deposit. In the western half of the central setting a deposit of Beaker pottery was identified: the sherds recovered appear to constitute two, possibly three, complete but crushed vessels. Several decorated sherds were identified with finger or thumb-nail impressions forming a herringbone design. This pottery was found adjacent to a large, decayed upright slab that could have formed one side of a cist that was destroyed with the subsequent redesigning of the cairn. Other finds from within the central area of the cairn include a small number of lithics - predominantly flake debitage - and charcoal. The exterior of the cairn appears to have been redesigned on a number of occasions, with evidence for possibly two phases of kerbing, and the subsequent enlargement of the monument with the addition of a covering of small angular stones. Two hammerstones were recovered from the top of the pre-cairn surface immediately adjacent to the outer kerb on the W side of the cairn. It is not clear whether the cairn would originally have been much higher than it is now, and it is possible that it may have been a platform rather than a raised cairn. The excavation of this monument will continue next season. 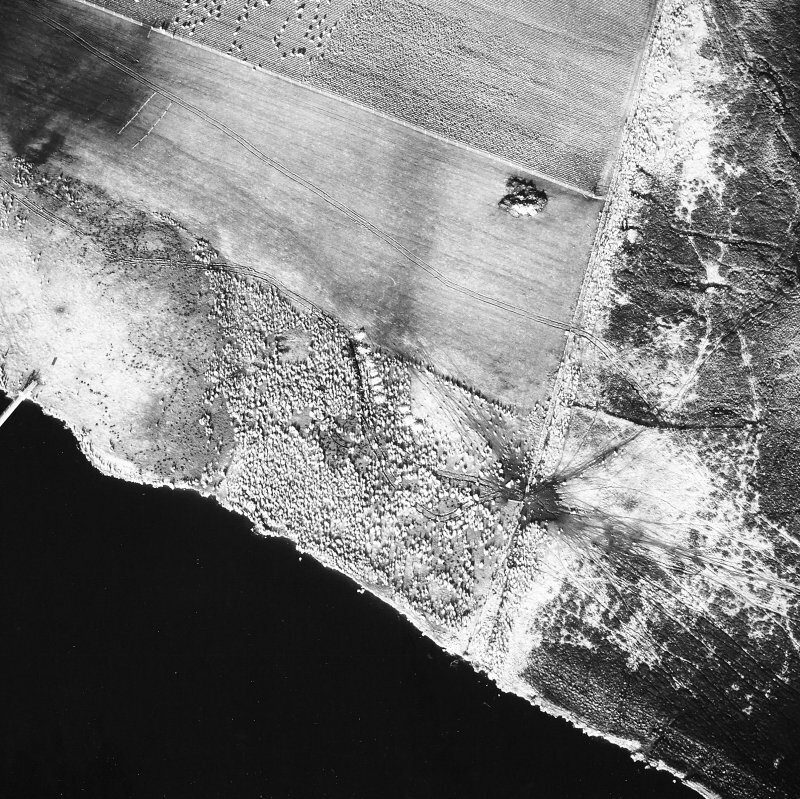 A trench was opened up 20m to the W of the cairn, on another low mound on the ridge top. The mound proved to be geological; however, an assemblage of 187 lithics was recovered from the overlying topsoil. 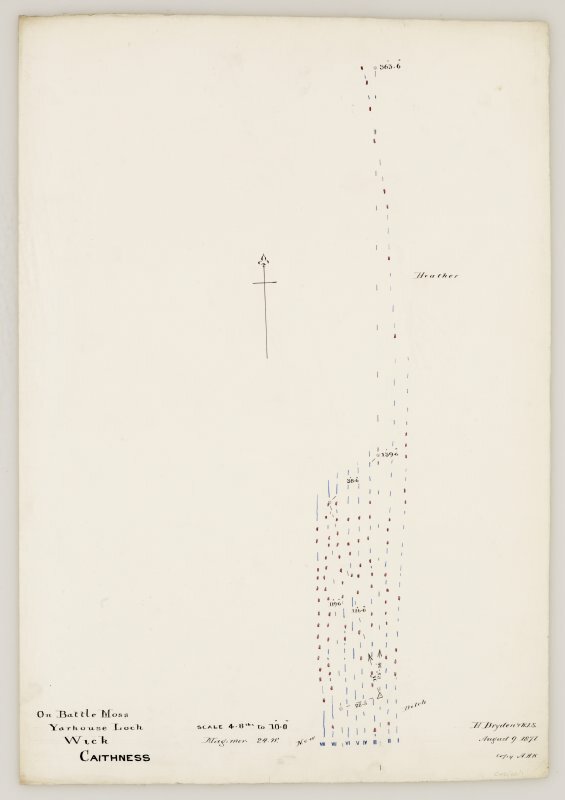 This comprises mostly debitage, but includes 11 narrow-blade microliths (scalene triangles and backed bladelets), together with a number of scrapers, demonstrating a Mesolithic presence on the ridge. Lithics were also recovered from the trenches around and adjacent to the stone rows. Much of the material is undiagnostic, but includes a number of blades, scrapers and a single blade core, suggesting Mesolithic activity along much of the loch edge. Sponsors: Caithness and Sutherland Enterprise, CED, Universities of Cardiff and Glasgow, Highland Council Roads Department. A Baines, K Brophy and A Pannett 2003. This setting of stone rows (YARROWS04 314) is situated at the southern edge of a field of pasture about 300m SE of North Yarrows farmsteading and some 50m E of the Loch of Yarrows. Situated on flat ground, the setting comprises eight roughly parallel rows of slabs set on edge. The rows are up to 2.5m apart and the longest measures 40m in length from N to S. The slabs are also aligned roughly N and S, and eighty of them remain standing, the tallest only 0.3m in height. At least another eleven slabs have fallen and, given the results of the excavation in 2003 (DES 2003, 94-5), it is likely that the apparent gaps in the rows indicate where other fallen stones lie hidden. The cairn (YARROWS04 048) is situated about 100m N of the stone rows. Recent excavation (DES 2003, 94-5) has revealed that it is a complex structure of more than one period. 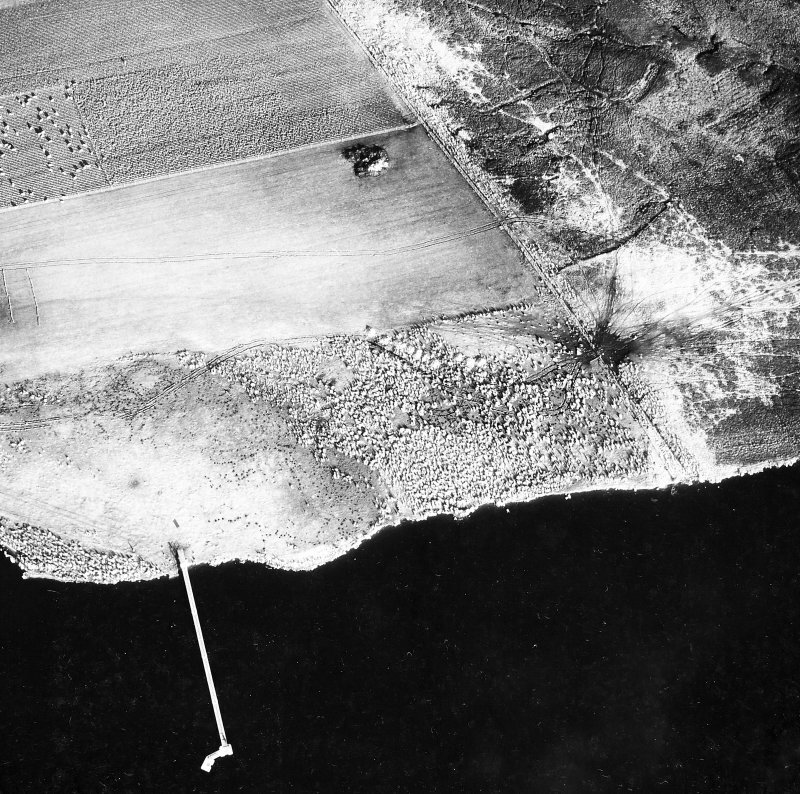 The excavation was backfilled, leaving a grass-grown mound measuring about 10m in diameter by 0.3m in height. A slab, which was erected by the excavators in 2003, stands on top of the mound. of the cairn revealed a sub-circular monument with a central space, within which Beaker and later Bronze Age pottery was found, together with deposits of cremated bone, one of which has been dated to 1600 cal. BC. The aim of the 2005 excavation was to reveal the full extent of the monument, and examine the possibility that several phases of construction and re-design had been undertaken in the building of the cairn. arrowhead and several small thumbnail scrapers. Beneath the upper cairn levels in the NE quadrant, an arc of 17 kerbstones was revealed, apparently defining the edge of one phase (putatively the second phase) of cairn construction. The kerbing was not evident elsewhere on the cairn. There was a distinct difference between the structure of the cairn within the kerbing and that outside. Within the kerbing, the upper levels of cairn material had been carefully placed, with slabs forming rough courses of walling in places. The lower levels of material within the kerbing comprised large slabs. Outside the kerbing, the cairn material was homogenous throughout, comprising slabs of comparable size to the upper levels within the kerbing, but which had been laid down more haphazardly, perhaps dumped. The central structure of the cairn, incorporating the central space excavated in 2003, appears to have formed the primary phase of construction on the site. This element of the monument was built using large boulders and slabs, and was probably covered by an earthen mound. The primary cairn was found to have been constructed not on the original ground surface, but on a levelled deposit of charcoal and ash-rich soil, which also contained small fragments of pottery, cremated bone and flint. This was found to cover a large pit or scoop cut into the natural bedrock, which was filled by soil containing occasional flecks of charcoal. There was not sufficient time to allow complete investigation of this feature, which will be fully excavated in 2006. Finds from the 2005 excavation were limited to flint and a few small sherds of pottery - no further material for dating was recovered. Phase 1. The initial phase of activity involved the digging of the pit/scoop on the site of the cairn. Phase 2. This feature was then covered by a layer of soil c 15cm thick, which was spread across an area approximately the same size as the subsequent cairn. The soil was clearly the result of cultural activities, and contained charcoal, ash, cremated bone, pottery and flint. Phase 3. The central setting of the monument was constructed, and surrounded by an earthen mound. It is not clear whether the central setting was filled at this time - further examination of the material sampled from different areas will hopefully shed light on this. Phase 4. At approximately the same time, the kerbing on the NE side of the monument was constructed (it is unlikely that this continued around the entire circumference of the cairn), and the section between the earthen mound and the kerbing was filled with stones. Phase 5. Finally, a thin layer of stones was spread across the whole monument, extending beyond the limits of the kerbing. While this would never have been a large, prominent feature, it would have completely hidden all of the structural features of the earlier cairn. Sponsors: Caithness and Sutherland Enterprise, University of Cardiff, University of Glasgow. ND 3129 4401 A final short season of excavation took place at the Bronze Age cairn (ND34SW22) to the N of the Battle Moss multiple stone rows (see DES 2003, 94-5; 2005, 90). During the 2005 season, a possible feature was identified in the subsoil once most of the cairn material had been removed. This feature was not excavated in 2005, but was identified provisionally as a pit/scoop associated with the initial phase of activity at the cairn. The objective of the 2006 season was to clarify the nature of this feature. Upon excavation, further Bronze Age sherds were recovered from a layer immediately above the feature, which had produced similar finds in previous seasons. However, the feature itself was unlikely to be man-made, and was more probably an irregular natural hollow, possibly even a tree throw, which was levelled out in the process of cairn construction. Sponsor: John Robertson Bequest (University of Glasgow). Andrew Baines and Kenneth Brophy, 2006.